Which Backing and Installation Method is Best for your Project? What is the best backing option and installation method is best for my project?? StonePly Co. gets this question at least once a day. Depending on whether the project is interior or exterior will typically dictate what type of backing to use and the installation method needed. If the stone panel project is interior, then StonePly stone panels on aluminum composite material backing (ACM) is ideal. This is the thinnest solution and will maximize your interior space. StonePly stone panels laminated to ACM backing is only 1/4″ thick which makes it ideal for interior use. StonePly ACM can be installed easily by a two man crew using the adhesive method. 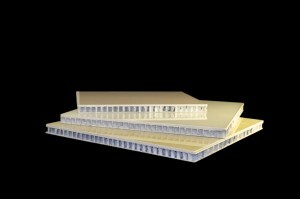 Structural silicone, such as Dow 795, adheres StonePly ACM stone panels to most wall substrates. It can even be used over most existing wall treatments. This doesn’t mean StonePly HoneyComb (HC) backing can’t be used for interior use. If StonePly stone panels are to be used as elevator cladding, StonePly HC would be used because it is non-combustable. StonePly HC Stone Panels can be attached to most substrates using any of the installation methods including: adhesion, z-clip, concealed screw, or interlocking channel. The most common solution for exterior use StonePly stone panels is StonePly HoneyComb (HC) because the HC backing has many more advantages over StonePly aluminum composite material (ACM) backing. StonePly HC acts as a radiant heat barrier. The stone deflects the heat from the sun and the honeycomb deflects heat or air from escaping from the building. The aluminum honeycomb acts like a thermos. It keeps the heat inside and deflects the cold. There are several methods of installation for StonePly HC panels. For a detailed list of methods along with installation instructions please see StonePly’s installation page.